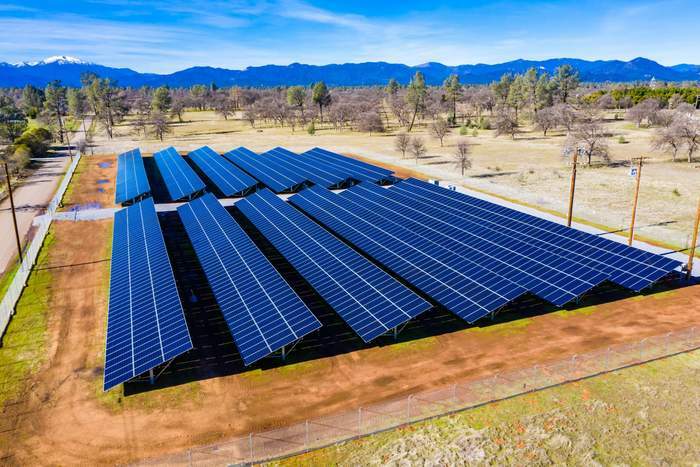 CalCom Energy and Bella Vista Water District announce the completion of a 693-kilowatt solar project to provide clean energy for the utility’s use in Redding, Calif. The system will advance the district’s sustainability efforts, improve resiliency and reduce costs by offsetting electricity used to pump water throughout the district. CalCom Energy designed and constructed a 693-kilowatt solar project for Bella Vista Water District in Redding, CA. The solar array reduces electricity costs and carbon emissions by using clean energy to pump water throughout the district. The solar project is the second solar PV system installed by the district as part of a comprehensive energy strategy to increase the district’s reliance on locally produced solar energy. Together, the two systems are expected to offset 75 percent of the district’s annual electricity use. Bella Vista financed the projects using a U.S. Bureau of Reclamation WaterSMART grant and district funds. The cost savings from reduced energy consumption is estimated to be well over $3 million over the next 25 years. CalCom Energy engineered and built the ground-mount system, located near the district’s Regulating Facility on Hidden Acres Road in Redding. The system is expected to produce more than 1,000,000 kilowatt hours of clean energy per year, offsetting the equivalent carbon emissions generated by 123 houses’ electricity use per year. “By leveraging District funds, we managed to maximize our overall investment in locally produced clean energy, which is central to the District’s energy strategy to reduce dependence upon retail power purchases and exposure to greatly increasing energy costs,” said David Coxey, General Manager of Bella Vista Water District.